ODS Grey-Line Select-2 sensor family offers outstanding quality and specifications at a price that establish a better price performance than seen before. 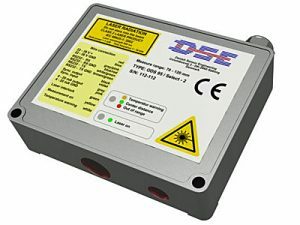 This compact and light new sensor design offers all the advanced features of our bigger and heavier sensors in the ODS Red-Line sensor families and still retain the old hall mark of ODS sensors, they can be connected for synchronized thickness/difference measurement without the need of additional control box or special calibration. The measuring principle is optical triangulation, as it is in all our sensors. There are 5 different measuring ranges in this series. From 5 mm over 10, 25 and 50 to 100 mm. All measuring ranges start from 70 mm and ends at 75, 80, 95, 120 and 170 mm respectively. Al sensors have a resolution at the close end of 0.001 mm. At the far end the resolution varies from 0.001 mm to 0.005 mm. Resolution is defined as 2 times the Standard Deviation when measuring static on white paper and outputting at full sampling frequency of 2 kHz without any averaging of the output data. The linearity of the measurement data is defined as the maximum deviation from the true value over the full measuring range. The 5 sensors works within the following limits: ± 0.003 mm, ± 0.004 mm, ± 0.008 mm, ± 0.013 mm and ± 0.025 mm, again operating at 2 kHz without any averaging. All sensors are classified as laser class IEC 2, which mean that they are not harmful to the human eye. The sensors are very robust and the housing is made of solid aluminum. The compact and robust housing of solid aluminum is suitable for most kind of environments, and the applications are innumerable and extend from laboratory usage to steel works and the offshore industry – wherever a noncontact precision measurement is advantageous. Warning signals tells when the environment temperature reaches the limit for trouble free operation, as well as there are indicators for center distance and measurements out of range. signal. The different sensor Modes are: Extended Thickness Mode (Thickness being the default Mode), Difference Mode (extended), Level Mode and Sample Hold Mode. Software with every ODS Grey-Line sensor provides easy setting of the Select parameters. There are 2 simultaneous output signals, a Serial interface and an analog signal. The sensors must be ordered with either a RS232 or a RS422 interface and either a 4-20 mA current or a 1-9 V signal. The sensor can be programmed to run at a baud rate of 115200 (2 kHz is default) or at 38400 baud giving a serial output rate of 1 kHz. The analog signal is always updated at 2 kHz except when the Simple average filter is in use. This sensor also has the new signal telling when the environment temperature reaches the limit that is acceptable for trouble free operation. Distance measurement on target with High Temperature. To meet this demands, the ODS Grey-Line family can be modified into High Temperature version to reach different levels of temperature, basically named HT, VHT and VVHT. As a rather unique feature the VVHT version are capable of measuring on extreme hot target surfaces up to 2.200ºC. The applications where the ODS Grey-Line sensors can be used are innumerable. They extend from laboratories to offshore industry – wherever a non-contact precision measurement is advantageous. Many of the sensors are being used in very harsh environments. As an example many sensors are being mounted on milling machines of different kinds e.g. milling marble, stone and cast iron or black rubber tyres.